The mission of the Social Ministry committee is to stimulate our parish’s awareness of human social needs and to develop effective responses to those needs. “Whatever you do for one of these the least of my brethren, you did it for me” (Matthew 25). Our committee helps the people of our parish meet the social needs of our brethren as Christ requested, bridging the gap between those in need and those who wish to help them. The generosity of St. Mark’s parishioners gives hope to those struggling to meet their daily needs. As a member of this committee you become more aware of the needs in our community and you are able to spread God’s love to those most in need of that love. Meetings: The 4th Tuesday of September, November, February and April in the Parish Kitchen from 7:00 to 8:00 PM. St. Joseph’s House of Hospitality - Eight Saturdays each year food for a noon meal is purchased, prepared and served to the poor at St. Joseph’s House on South Avenue. Contact: Lynne Fuller 227-0233 for more details on this very important program. Winter Coat Drive – Each October winter coats are collected for the House of Mercy to clothe Rochester’s poor and homeless in the inner city. 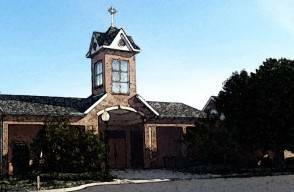 Holiday Food Baskets - For the Thanksgiving, Christmas and Easter holidays food is collected and delivered to those in need in our area and flowers are purchased and delivered to shut-ins in our Parish on the Sunday before the holiday. We need workers to sort and box the food and deliver food baskets and flowers. Advent Giving Tree - Our parish provides Christmas gifts for the children served by the Catholic Family Center Children and Family Services and needed baby items for the Women’s Care Center on Lake Avenue which provides help and support for women in crisis. The Advent Giving Tree is displayed at the entrance of the church starting on the weekend before Thanksgiving. Parishioners are invited to take an ornament from the tree, purchase one of the suggested gifts and return the unwrapped gift by the date indicated on the tag. Sock and Mitten Sunday – In January new and lightly used socks, mittens, hats and scarves are collected for the poor served by The House of Mercy. Summer Projects – Personal care products are collected for Mission Share Outreach Center on Long Pond Rd. and school supplies and children’s underwear are collected for refugees served by Mary’s Place Outreach Center on Lexington Avenue. Food Collection: This is an ongoing project that provides non-perishable food for the Greece Food Shelf. Collection boxes are located at the entrance to the church and food may be donated at any time.